The US presidential race is a fanfare of big budget communications and PR - orchestrated televised debates, celebrity endorsed rallies, and sweeping rhetoric that plasters the front page news. It is, to all purposes and ends, a Hollywood screenplay steeped in valour, triumph and clichés. However, let’s step back one pace to the primaries; the election of a delegate to run for presidency. Here the politics get really filthy. The daggers are pointed in-house and the bargaining shifts into the backroom. Allies become competitors and your personal history is farmed. Press officers and spin doctors fully understand that a clean reputation takes years to build, but only moments to muddy and scandalize. 'The Ides Of March' is a political thriller centred around Democrat Governor Mike Morris’ (George Clooney) campaign bid and his two press officers; the steely veteran Paul Zara (Phillip Seymour Hoffman) and the young whippersnapper Stephen Myers (Ryan Gosling). Myers discovers a secret that threatens to wreck the successful campaign in its final throes. Simultaneously, Myers is propositioned by Morris’ rival for his slick manipulation of populist opinion and respect in media. With echoes of themes from his second directorial, 'Good Night, And Good Luck', George Clooney has adapted a play by Beau Willmon, a former member of the 2004 failed campaign of Howard Dean. The film has been refined and stylised by 15 other executive producers, including one Leonardo Di Caprio. The cast is laden with actors in particularly gritty recent roles: Paul Giamatti ('Too Big to Fail'), Evan Rachel Wood ('The Conspirator'), Marisa Tomei ('The Wrestler'), Jeffrey Wright ('W.') and Max Minghella ('The Social Network'). Sprinkle on top Ryan Gosling’s mainstream ascendance and you have a fearsome company of actors for a thriller. Many have mentioned Clooney’s character echoes John Edwards and his tribulations following a derailed 2008 campaign due to an affair with a staffer and fiddling expenses. However, with Obama vs. the Republicans II on the horizon and Andy Coulson’s former role with the UK government under intense scrutiny, this film will arouse interest from not only the politically interested, but more generally, the politically aware. The reception from the 2011 Venice Film Festival was warm, but most interestingly, political insiders were reportedly astounded at the authenticity of the interaction between staffers. The film is a snapshot into the established weak spots of the political turbine. 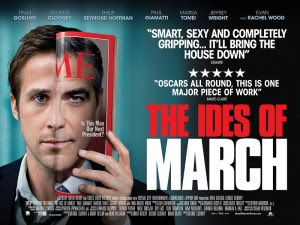 As reported in the NY Times, Barack Obama asked of Mr Clooney whether 'The Ides of March' should be shown in the White House, to which Mr. Clooney promptly responded "absolutely not". An Oscar contender? Very probably. More challengers to come in 2012? Indisputably. 'The Ides Of March' is released in UK cinemas on 28 October 2011.